Valentine’s Day is such a wonderful holiday. All the hearts, chocolates, cakes, cookies, candies just seem to draw me in like Earth’s gravitational pull. I intended to bake my Individual Chocolate Heart Cakes but could not find the pan. Rather than let a little thing like that deter me, I decided to bake the cake in a ¼ sheet pan and cut out the hearts using a cookie cutter. Great idea, poor execution. The ¼ sheet pan was not deep enough, so my oven had the pleasure of enjoying chocolate cake as it dripped over the pan. That was not the aroma I was hoping to savor. Not to be beaten by a pan, I baked the cake in a 9” x 13” baking pan because I knew there was no way the batter would bake over those edges. Lining the bottom of the pan with parchment paper made it a breeze to turn the cake out onto a very large board. This chocolate cake is more delicate than a devil’s food cake so you will want to make sure the cake is cold before cutting out the heart shapes. Also, cut off the edges of the cake so all hearts have the same consistency. There will be plenty of extra pieces of cake leftover from cutting the heart shapes. I used a 4½” cookie cutter and was able to make 6 individual cakes. Shoshana took some of the scraps of cake and mixed them in with her ice cream. I chose to top a scrap piece with the chocolate glaze for a delicious snack. If you happen to have two baking pans with the heart shaped cakes in them (6 hearts per pan), by all means make the recipe using those pans. Yet, I must admit there is a part of me that doesn’t mind if I can’t find those pans. I love the look of these cakes even more and I get extra cake as well. 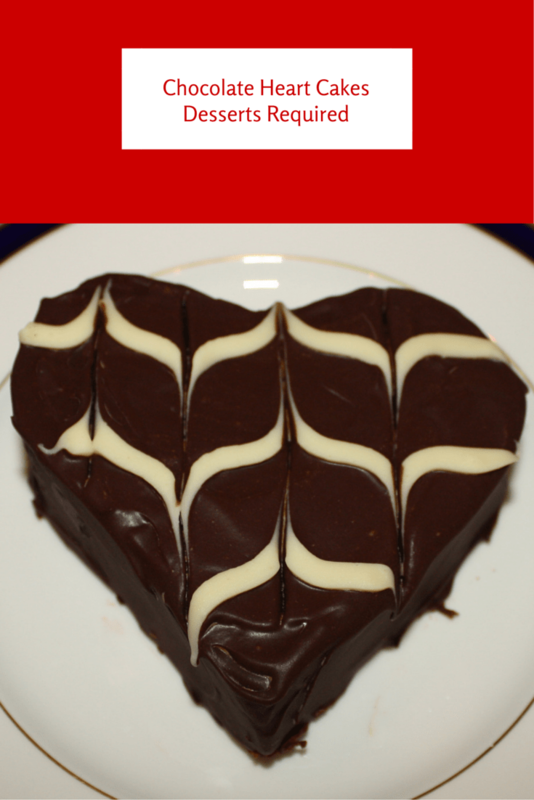 Whether you have that special someone with whom to spend Valentine’s Day or are happy to enjoy the holiday with friends, Chocolate Heart Cakes will certainly put a smile on their faces. Preheat the oven to 350º. Butter a 9” x 13” baking pan and line with parchment paper. Set aside. In a small bowl whisk boiling water with cocoa, sour cream and vegetable oil. Set aside. In a separate bowl whisk flour, baking soda and salt together. Set aside. Beat butter and brown sugar in a mixing bowl on medium high speed for 3 minutes, scraping down as needed. Add eggs. Blend in ½ of dry ingredients, followed by the cocoa mixture. Add remaining dry ingredients. Lastly, add melted unsweetened chocolate and vanilla. Transfer batter to prepared pan. Bake in 350º oven for 25-30 minutes or until toothpick or cake tester comes out clean. Refrigerate until cold. Use a small metal spatula to go around edges of pan. Invert cake onto large board and remove parchment paper. Cut edges off cake. Use a 4½” heart shaped cookie cutter to cut out 6 large heart shaped cakes. Transfer heart cakes to cooling rack. Refrigerate for 30 minutes. Place chocolate chips in medium bowl and set aside. Simmer butter, whipping cream and corn syrup in small saucepan. Pour over chocolate and allow to sit for 5 minutes. Stir until smooth. Set aside to cool for 10 minutes. Spread a thin layer of the glaze over top and sides of each cake and refrigerate for 20 minutes to set. Melt the white chocolate and transfer it to a small freezer bag. Cut corner off bag and set aside. Once the chocolate has set, add another thicker layer of the glaze over top and sides of each cake. Pipe three straight lines of white chocolate evenly across the heart. Drag a toothpick through chocolate, starting at the top of the heart and taking it to the bottom. Then reverse the motion to drag the toothpick from the bottom to the top. Continue to do this one or two more times. This will give a herringbone pattern. Refrigerate to set. 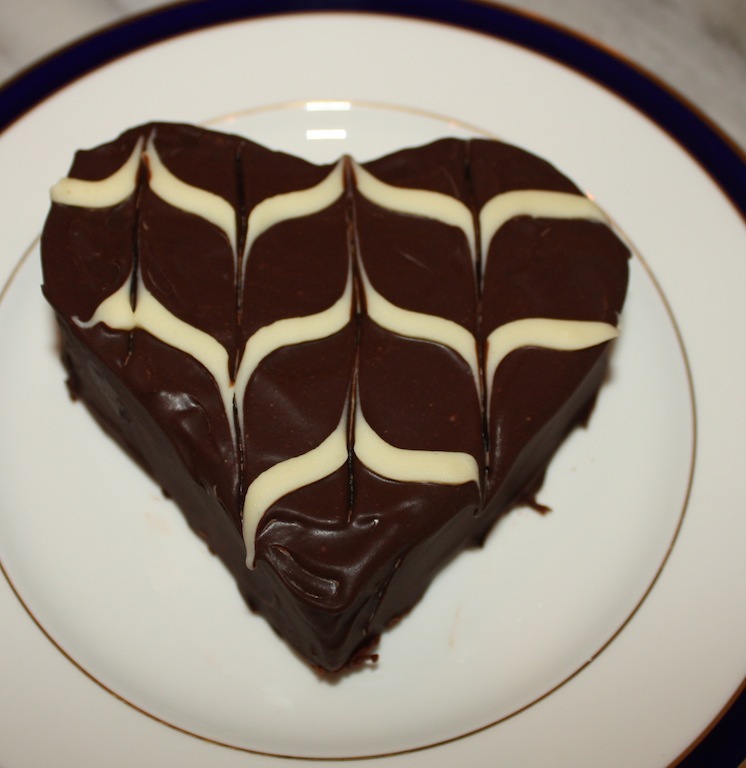 Transfer Chocolate Heart Cakes to individual plates or a platter. Serve at room temperature. Double glaze recipe if you want to cover the scraps of cake. Additional time is needed for refrigerating cakes. I think I must try these! I think you and Mr. Healthy Life are going to LOVE them, Amy! These are so gorgeous! I love the marbled pattern. Worth trying for sure Betsy… You always share the best stuff my friend. Thank you so much for your very sweet words! Much appreciated! !